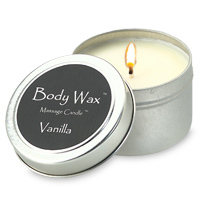 Vanilla - Dark, sensuous and complex, these are the qualities we have selected for our Vanilla. Like the humid rainforests in which the beans grow and mature, these nuances reflect the beauty, allure and seduction of nature. Our candles appeal to many senses; the visual, tactile and olfactory. By using cosmetic grade soy oil rather than traditional waxes such as paraffin or beeswax, we are able to offer a candle in which small amounts of the warmed oil can be directly massaged into the skin, leaving skin smooth, soft and pleasantly scented. 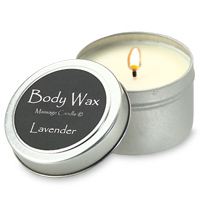 Unlike paraffin, beeswax and gel candles, properly wicked soy wax candles melt at a safe and comfortable temperature. Soy wax burns 95% cleaner than paraffin, producing little or no soot. We use hemp wicks without metal cores in our candles, and each wick is firmly affixed to the bottom of the container so that it will not shift when the container is moved. Once the candle is exhausted, any remaining wax can be easily removed with hot soapy water and the container reused or recycled. The sweet Japanese Gardenia and the sultry Spanish Jasmine are much like Puccini's Cio-Cio San and Bizet's Carmen. While we doubt you will ever find such a pairing at The Met or La Scalla, we hope that you will enjoy it in the production we have created for you. What better way to capture the sun-drenched shores of the northern Mediterranean than with Lavender? Feel the warmth of the Mediterranean sun; let a sense of peace take over as Lavender fills the air. Brilliant as a tropical sunset, intoxicatingly fragrant, succulently sweet; mangos are the essence of exotic paradise. Feel waves wash gently back and forth across your feet, hear wind whisper sweet secrets in the palm trees, let the sun warmly caress your shoulders. Relent to the charms.